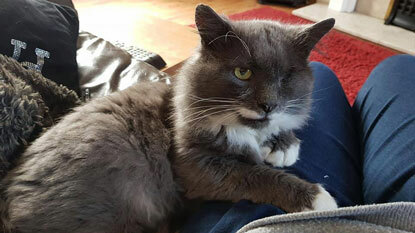 Named after a one-eyed warrior from the popular TV series Game of Thrones, Beric was found living in Llandudno Junction. Thought to have been a stray for quite a while, he was gathering a few scars and had suffered a nasty eye injury. Thankfully, a kind lady had been feeding him regularly. After feeling worried about his welfare, she contacted the Colwyn & District Branch of Cats Protection to report him as a stray. Beric was taken to the vets, where he had surgery under general anaesthetic to remove his damaged eye. He was also neutered, vaccinated, microchipped and treated for parasites. 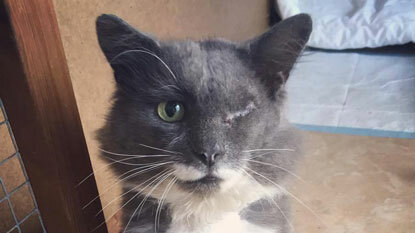 Once healed, Beric soon adjusted to life with one eye and became increasingly confident and friendly. Once he was signed off by the vet as fit to home, Beric was put up for homing. After his picture was publicised on the branch’s website, it wasn’t long before he found an owner in a local cat-lover called Kim. Beric’s name was changed to Derek, signifying a new beginning in his forever home. A new beginning for Beric – now Derek – and an excellent companion for Kim.